​who lived a reclusive life in Yorkshire and exhibited at the Fine Art Society. 1929 - Born and raised in the area of Roundhay. a suburb in north east Leeds. His father was a member of the local police force. However his art studies were interrupted by a requirement to do his mandatory two years of National Service. He spent most of his two years with the RAF in Egypt - guarding the Suez Canal. After which he returned to college to complete his studies. Shortly after left college, it was found that he had contracted tuberculosis while with the RAF. He was sent to a sanatorium to recuperate and while there he had ample time to develop further his skills in painting. This was also the time when he developed his first botanical drawings. After he left the sanatorium he was minded to try and exhibit his work. He sent several of his drawings to a botanical art exhibition in London organised by the Royal Horticultural Society. He has won several awards from the RHS for his work. His work was noted by a number of distinguished plants people including Dr Harold Fletcher, a botanist and Director of the RHS Gardens at Wisley. The actor Ernest Thesiger (cousin of the explorer Wilfrid Thesiger) encouraged Jack Naimaster, then a director of Walker’s Galleries at 118 New Bond Street, to go and view them. He started to exhibit his art with Walker's Galleries until they closed. In later years he divided his time between botanical and wildlife painting and the cultivation of rare and exotic plants. An intensely private man, Raymond Booth was immersed in his own world of poetry, plant cultivation, and the natural history of the few square miles around Adel Woods on the outskirts of his native Leeds. 2002 - a major retrospective exhibition at Leeds City Art Gallery which he and his wife were persuaded to attend. 2011 - an exhibition was held at the Fine Art Society to celebrate his 50 years as a gallery artist - during which time he only visited the gallery once! July 2015 - he died at his home in Alwoodley - his death was announced on 22 July. 2015 - A memorial exhibition (see below) was held at the Fine Art Society to celebrate both his life, his work and his extraordinary career. The process of making his paintings and the continually deepening knowledge of his subject that this intensive, almost microscopic, focus produces are all that interest him. A lot of his paintings were of British Mammals and bird life. However he rarely left his native Yorkshire. However he also devoted himself to painting plants, particularly those which could be grown in gardens or a greenhouse and those suitable for background vegetation for his naturalistic animal studies. He was said to observe a plant through one or more growing cycles before taking up his brush. His painting room at home in Alwoodley – an 'inner sanctuary' was sacrosanct. Nobody was allowed to enter it - not even his parents or later on his wife, Jean. In terms of media, unusually for a botanical artist, he prefers to paint using oil on sized paper. He was also fond of sometimes giving his plant portraits a coloured background in much the same way as used for portraits of people. He also produced a number of graphite drawings. Japonica Magnifica is his 'magnum opus'. This book portrays the flora of Japan, some in the context of the Japanese landscape where it grows. The project to develop the book grew out of twelve years of correspondence with Don Elick, an American plant collector. He had lived in Japan for more than 40 years. Both men loved Japanese flora and landscape. Booth grew and then painted 85 paintings to illustrate the book , published in 1992. Elick provided many of the specimens for the artist, who grew them in his garden in Yorkshire, England, in order to study them and draw them from life. Each plant portrait was true to scale. 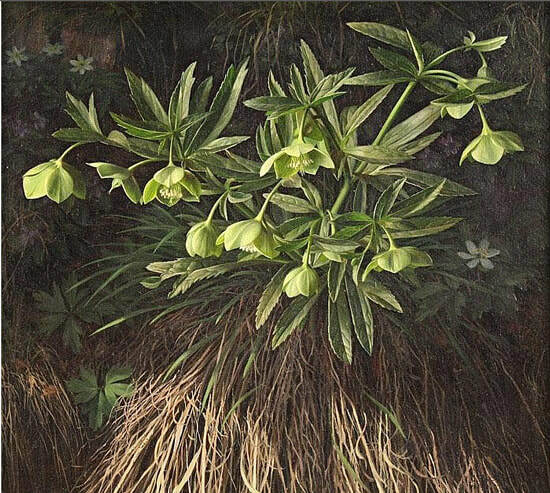 Booth's botanical paintings were remarkably accurate, including depictions of Japanese plant habitats that the artist himself had never seen. 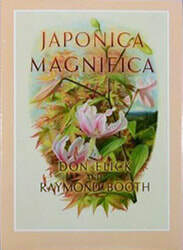 This very large book portrays the flora of Japan and is a collaboration between Don Elick, an American who lives in Japan, and Raymond Booth. The book includes a map of Japan in the front and 64 colour plates of plants flowers - some of which are double page spreads. The deluxe edition of the book, which contained two specially commissioned plates signed by the artist, was available from The Fine Art Society. 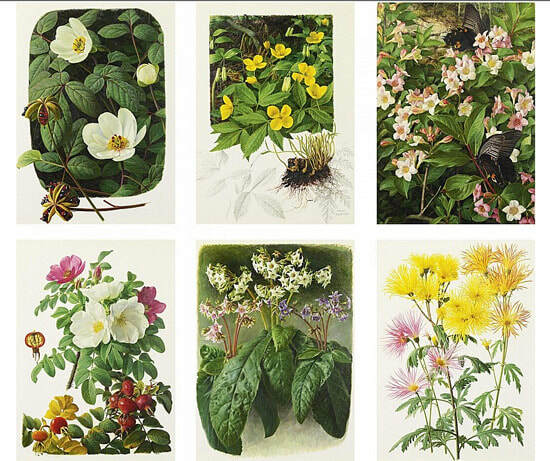 32 full-page full-colour plates of paintings of flowers. Sagapress Inc./Timber Press Inc. in the United States. Raymond Booth: An Artist’s Garden, with text by Peyton Skipwith, was published by Callaway Editions, New York in 2000. 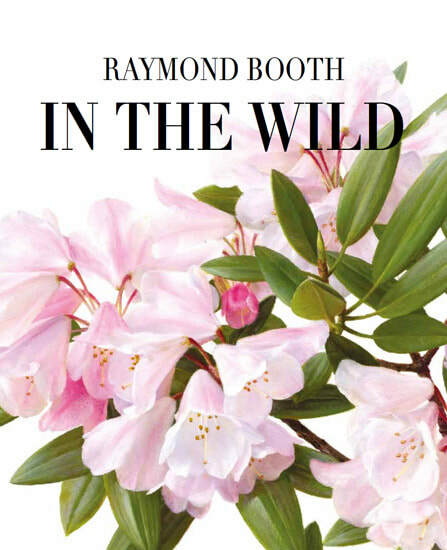 The fans of Raymond Booth's preference for meticulous precision and lush renderings in oil of the flowers and plants in his garden is fulfilled by this book. This is the the first comprehensive collection of Booth's particular type of botanical painting - which is presented in an oversized format with complete fidelity to the original works of art. Raymond Booth: Artist, Naturalist by Peyton Skipworth was published in 1982. It's a 24 page catalogue for an exhibition held at 148 New Bond Street. It has colour illustrations and catalogue of 80 works. 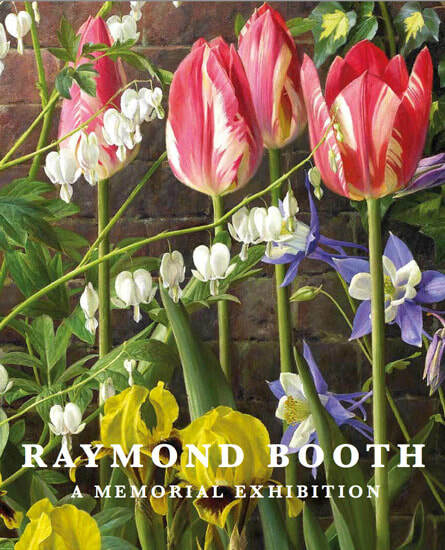 Raymond Booth: Painter & Plantman published by the Fine Art Society in 1991 to accompany the exhibition held April/May 1991. Soft cover, 31 pages fully illustrated in colour. ​Exhibitions of his paintings are still held on a regular basis. 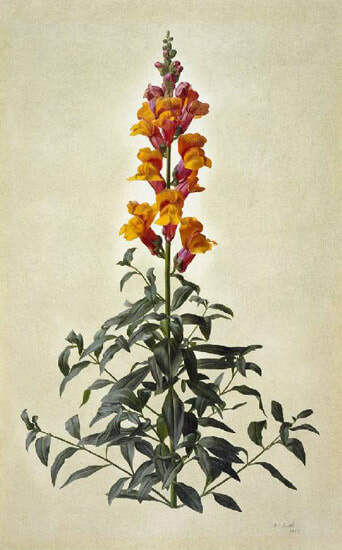 They are almost always a mix of his natural history and botanical paintings. In her first book, Shirley Sherwood tells a story of how she was introduced to his work by queuing on a chilly pavement outside the Fine Art Society at 7.30am in the morning - and was still sixteenth in line to buy one of his paintings! Alan and Jane Clark were also fans and queued for his work. Patricia Cornwell, the noted thriller writer and collector was also a fan and bought a number of his works at the retrospective at Leeds Art Gallery. 1984 - a retrospective exhibition of his work was presented at several galleries in his native Yorkshire. Elvehjem Museum of Art (University of Wisconsin—Madison). the Hunt Institute for Botanical Documentation in Pittsburgh. A fusion of technical skill and a keen eye, with a deep passion for nature and solitude, Booth’s genius rested in the intimate relationship that existed between himself and his subjects. Gorse & Yellowhammer. Oil on card. Signed and dated, 2000. 21x25cms. Framed: 37x40cms.